The series is no longer about American history. It’s about Don’s history. And it’s scary as hell. Mindful of the recent “sick day” on which Don Draper drunkenly slouched through a viewing of a Nixon ad, I approached last night’s episode of Mad Men half-expecting the season finale to be powered by at least a bit of electoral energy. Converting this half-expectation into an active wish, I began planning to compare and contrast the misadventures of Draper and crew with the mistakes registered by George Roundy, the hairdresser played by Warren Beatty in our country’s great bedroom farce, Shampoo, set on Election Day 1968, and ending on a cliff above the frontier of the promised land. I realized it ought to be easy to generate a spark of an idea about ambition, masculinity, and the American dream in the friction between the two productions. 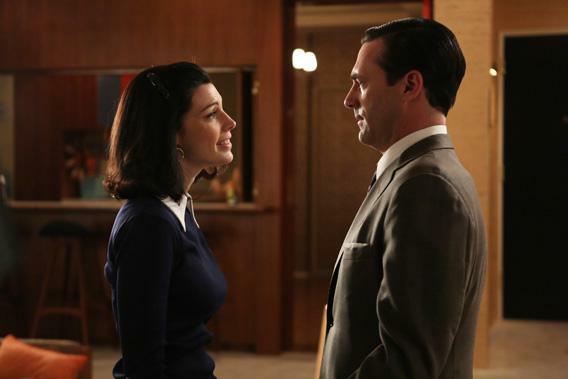 But I hadn’t yet realized what I’d already felt, that Mad Men has stopped being a period piece. Among the signs of artistic growth that mark the show’s sixth season as its best to date is that it is has stopped using the past as a crutch to prop up its scenarios. In its first season, when the calendar paged across the second Tuesday in November of 1960, the producers wrought much ballyhoo. The agency had Nixon as a client; thus, according to the alternate rules of historical fiction, the audience had to credit Sterling Cooper with the real Nixon’s campaign slogan (“For the future”) and had to grin and bear a handful of instances of U.G.H. (unfortunately gratuitous historicism). I take its moments of jagged tonality to represent the cracks of a maturing voice, and its excesses as shrewd expressionistic choices. (Yes, it seemed rather much for the season opener to quote Dante’s Inferno by way of bearing down on Draper’s midlife crisis. But Don Draper is not having a midlife crisis. His life is the crisis, and it’s got momentum.) This season, less eager to please and more anxious to jar, Mad Men has moved its mimicry of then-current events farther back in the thematic mix. The tail end of the season breezes past the election to tumble toward the more emotionally momentous holiday of Thanksgiving. Think of it this way: Now that Mad Men has stopped attempting to be Updike’s Rabbit series, an analytic diorama, it has focused its self-consciously literary efforts on the more interesting business of being Updike’s Couples. American history is just a thing that happens, like the weather, and instead the personal past is the nightmare from which Draper—off the sauce and onto a mission of radical reinvention—may yet awake. The show is pitching Draper’s epiphany as a program of radical transparency, enacted by a character known for his opacity and invisibility. I appreciated the elegance of the episode’s return to the season opener. There, Draper, creating a campaign for a hotel in Hawaii, produced a spooky-Zen print ad featuring an empty suit on a beach. Here, when the clients arrive for a meeting, his partners can’t find him. It is as if, embracing the idea of the ad, he has disappeared. Where to? The bar stool, where he’s doing just fine. Man, the crusty old symbolism of American masculinity had a rough week: Undone by cars and guns, trembling with delirium in the absence of alcohol and with fear in the face of adultery, the strong and silent majority of the ensemble did not do much to give patriarchy a good name. Not for nothing does Draper’s come-to-Jesus moment—his outing of himself as an orphan, for the sake of his relationship with his kids—happen during a meeting with Hershey’s. “The wrapper looked like what was inside,” he says early in the episode, a professional illusionist and existential imposter appreciating an honest façade. He repeats the line later. Shortly, he takes his kids on a car ride to visit the house where he grew up. A kid eats an ice-cream treat on the stoop of the house, at the end of the finale, while Don begins to reconcile be and seem. Everything for a moment is back where Jesus wants it.